Asbestos is a naturally occurring mineral that was once considered very useful for construction applications. Unfortunately, it is very dangerous. 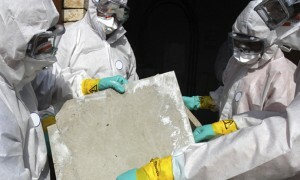 Dust from asbestos-containing materials will contain microscopic fibers that can lodge in the lungs and cause mesothelioma or even cancer with repeated or severe exposure. The good news is that methods of asbestos abatement in West Hills CA are now very advanced and can protect you against the ill effects of asbestos contamination. How Do I Know If Need Asbestos Abatement in West Hills CA? If your property does contain asbestos, the next step is to assess the level of risk that the material poses. In general, intact materials are not dangerous. The danger arises if they are damaged or may become damaged, as they will then begin releasing hazardous fibers and dust. This can be prevented with asbestos abatement in West Hills CA. Encapsulation: This method involves covering the asbestos-containing material with a sealant to prevent further damage to the material. Removal: If you want all asbestos dust as well as the source materials gone, asbestos removal is obviously your best option. All of our workers are highly trained and conscientious about safety on the job. Our expertise means you never have to worry about our asbestos removal services leaving any dust behind—we not only bag the big waste but also use HEPA filtered vacuums to remove all the tiny asbestos dust particles. We’re confident our work will pass any inspection and make it easy for you to secure reoccupancy clearances if needed. Please give us a call at 800-481-8080 to learn more about our services. Our asbestos removal office for Asbestos Abatement in West Hills CA is open Monday through Friday between 8:00 AM and 5:00 PM and closed for lunch from noon to 1:00 PM. With advance notice, projects can be scheduled for weekends, early mornings and evenings.